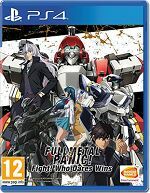 Tactical Map - In Full Metal Panic! Fight! Who Dares Wins, heated battles between Arm Slaves will unfold during battle parts known as the "Tactical Map." Each map will see the appearance of various battle fields that previously appeared in Full Metal Panic. Not only will battles unfold will battles unfold in the suburbs, there will also be battles on the outskirts of Jindai Municipal High School and in the arena of the Southeast Asian city of "Namusaku."